Is Roy Ngerng A Radical Leftist? His Interview With Joel Lazarus. More than meets the eye…..? In his latest blog post, Roy Ngerng posted a video of his interview by a `British academic and activist’ Joel Lazarus where he discussed about the defamation suit and his `activism work’. He seemed to be very proud to be finally given the recognition he thought he deserved. I mean, getting an interview by a British academic and activist. Wow. Imagine the international publicity that would garner. But does he know who Joel Lazarus is? The answer to this question is important and we will get to that later on in this article. Joel lazarus teaches international relations, international political economy, and international development at Oxford, Reading, and SOAS and co-founded both the Free University Network and a popular education project called ‘PPE (People’s Political Economy)’ in Oxford. 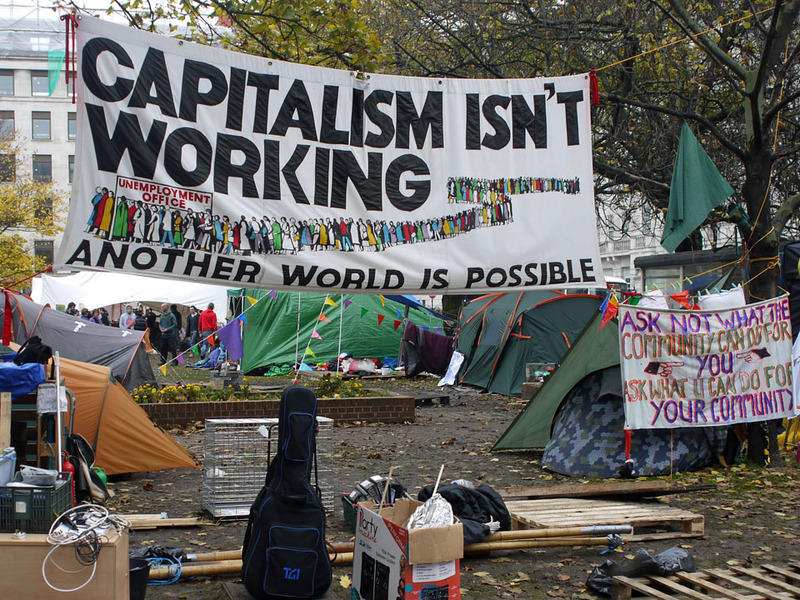 In 2012 Joel Lazarus and PPE participated in Occupy London; a series of protests that began in solidarity with the Occupy Wall Street protests in New York, United States. It was a non-violent demonstration against economic inequality and its original remit was to unite workers and unemployed alike in order to bring to the fore, social injustice, corporate greed, the undemocratic nature of international institutions and the global financial system, the lack of affordability of housing and the influence of companies and lobbyists on government. And here comes the juicy part. In fact, if you read carefully the article by Joel Lazarus, it smells heavily of Marxism. Columnf.com, by its own admission is a `nascent news and views magazine with a radical left-wing perspective’. Some would argue that the term radical left-wing is an euphemism for Marxism. Now what do you think that `f’ in columnf stands for? The letter `f’ stands for `Fifth’ as in the Fifth Column. By definition, a fifth column is any group of people who undermine a larger group—such as a nation or a besieged city—from within. The activities of a fifth column can be overt or clandestine. Forces gathered in secret can mobilize openly to assist an external attack. This term is also extended to organized actions by military personnel. Clandestine fifth column activities can involve acts of sabotage, disinformation, or espionage executed within defense lines by secret sympathizers with an external force. In contemporary use, a Fifth Column refers to a group of people who act traitorously and subversively out of a secret sympathy with an enemy of their country. In short, columnf is a radical left-wing movement. Now back to my earlier question. Was Roy Ngerng aware that Joel Lazarus is a radical leftist or even a Marxist before he agreed to be interviewed? My hunch says that Roy was aware that Joel Lazarus is a radical leftist. He introduced Joel as an `activist’. Meaning he knew of Joel’s background and for someone who is so `good’ at digging up obscure government data and statistics, I am sure he would have no problem in finding out about Joel Lazarus’ history. And how long have they known each other? Did Joel suddenly appear and asked Roy for an interview? I doubt it. Is Roy Ngerng part of an international radical leftist group out to undermine the economic and political system of Singapore? Has he all along been receiving the `tools’ or instructions from this group to `understand the political-economic system and to organise resistance’? Is he aware that he has been made an agent? I have written an article before about the dangers that may stem from the activities by people like Roy Ngerng. I have all along been suspicious of their real motive, intention and patronage. I do hope my suspicion is wrong. And I do hope that Roy Ngerng was just being naïve and stupid. Whatever it is, he has got an explanation to do or he may find himself facing something more problematic than a defamation suit.